Another happy month with Ipsy! 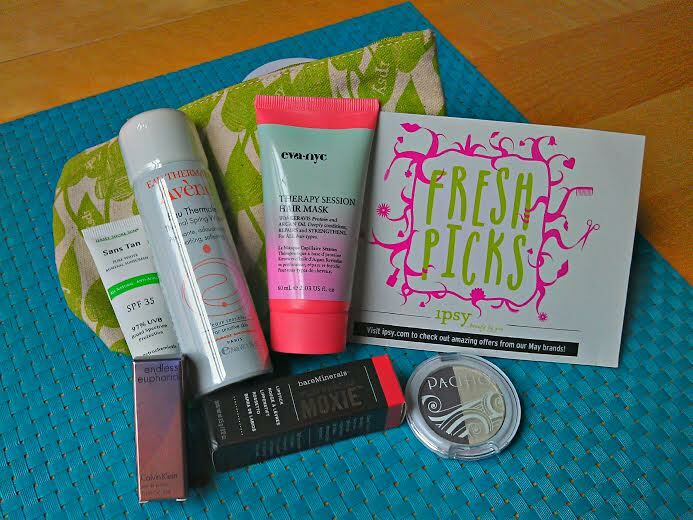 The Fresh Picks May 2014 Glam bag from Ipsy didn't disappoint. I was reading a few other reviews and it seems some weren't happy with the selection of items. I've got to say I'm not one of them. This month's glam bag introduced me to a new perfume scent I really enjoy, a great anti-aging sunscreen and a really exciting hair mask. I know I'm always gushing over how much I love this bag, but it's genuine. I love the anticipation of waiting to see what will be coming, the email saying that my ipsy glam bag is on the way and opening up my bag to see what goodies I've received. It's a present I buy for myself every month. Now that I've officially cancelled Birchbox, I also have found that I don't even need another beauty box to feel like I've got enough to try. The sample sizes are usually deluxe and I love trying new things. The Moxie lipstick by Bare Minerals was my bonus. If you get friends to join IPSY you too can snag some really great goodies at the end of the month with the points you earn. You also earn points for reviewing and sharing so get on it! Is Avene any good? I'm looking for new skincare to try! Have you tried Vain Pursuits skincare? Splendies Review. A new monthly subscription you're going to love.